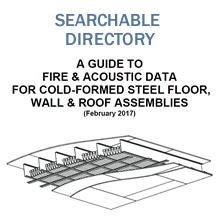 Cold-formed steel (CFS) is non-combustible, which reduces the risk of property loss during construction and over the life of the structure. Reduced risk of property loss leads to lower insurance premiums for builders and owners. When it comes to controlling costs on your next commercial or multi-family residential building project, you have choices. Selecting high-quality cold-formed steel over other framing materials is one. Choosing the Zurich Builders Risk Plan is the other. Both are good options in themselves, but together, they create an unprecedented compounded benefit. On every one of your building projects, every time. New consistent classification of steel framing as non-combustible, offered through the Zurich Builders Risk Plan, can reduce your premiums when compared to combustible frame construction. The Steel Framing Alliance and DiBuduo & DeFendis Insurance Brokers, LLC (a member of Assurex Global), have launched a comprehensive insurance program that provides builders who use steel framing with as much as a 43 percent discount on a broad range of insurance products. This program makes steel framing even more competitive with other construction materials. Named “STEEL Advantage,” the program is specifically tailored for cold-formed steel-framed construction projects, including single-family tract, low-rise multi-family, mid-rise commercial and mixed-use structures. The program is currently available to all cold-formed steel construction projects nationwide. For more information contact Charles Specht, CIC (559) 437-6556 or [email protected].